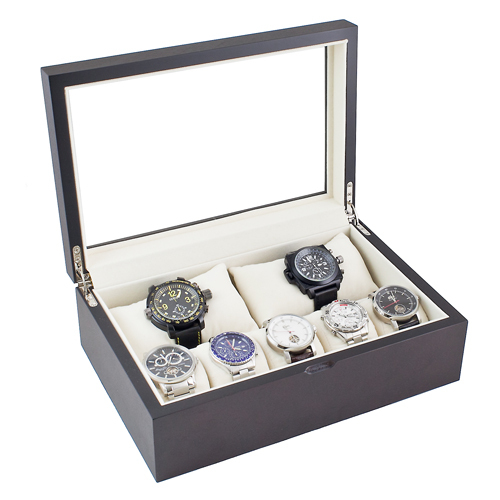 Elegant vintage wood watch/jewelry display case will protect your precious watch/jewelry collection and help to keep them organized. It will also match many home decors. SOFT LIGHT BEIGE SUEDE LINES THE INTERIOR--the soft interior will help to protect your watches and jewelry from scratches. EACH DIVIDER WILL HOLD A WATCH WITH CASE (INCLUDING CROWN) UP TO 2 INCHES/ 5 CM OR LARGER IN THE LARGER SECTION. Watch case dimension 30.4 cm (L) x 20.4 cm (W) x 10.2 cm (H).